The fifth pillar of Islam is to make a pilgrimage (Hajj) to Mecca, in Saudi Arabia, at least once in one's lifetime. This pillar is obligatory for every Muslim, male or female, provided that he/she is physically and financially able to do so. Prerequisites for performing the Hajj are to be a Muslim, to be free, to be an adult or mature enough, to be of sound mind, and to have the ability to afford the journey and maintain one's dependents back home for the duration. The reward for the Hajj is nothing less than Paradise. The Hajj is the ultimate form of worship, as it involves the spirit of all the other rituals and demands of the believer great sacrifice. On this unique occasion, nearly two million Muslims from all over the globe meet one another in a given year. Regardless of the season, pilgrims wear special clothes (Ihram) - two, very simple, unsown white garments - which strips away all distinctions of wealth, status, class and culture; all stand together and equal before Allah (God). The rites of Hajj, which go back to the time of Prophet Abraham who built the Ka'bah, are observed over five or six days, beginning on the eighth day of the last month of the year, named Dhul-Hijjah (pilgrimage). These rites include circumambulating the Ka'bah (Tawaf), and going between the mountains of Safa and Marwah, as Hajar (Abraham's wife) did during her search for water for her son Isma'il. 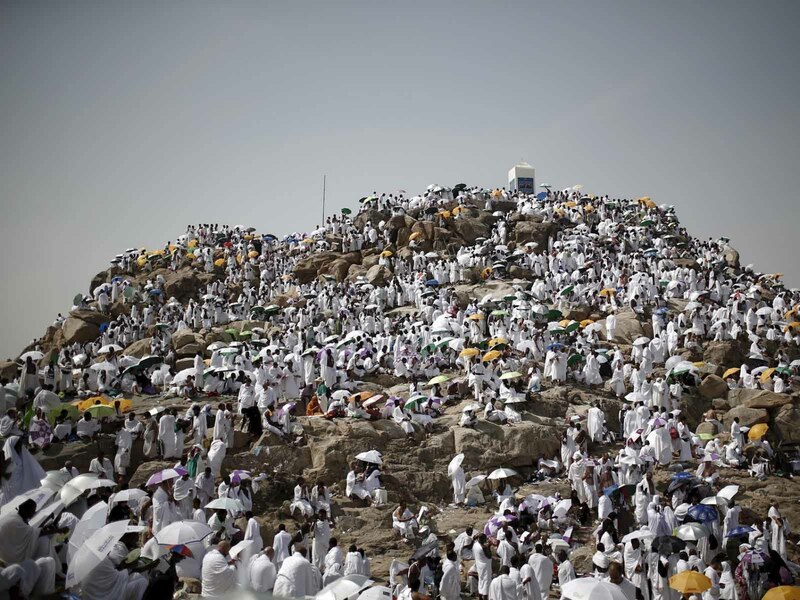 Then the pilgrims stand together on the wide plain of Arafah and join in prayers for God's forgiveness, in what is often thought of as a preview of the Last Judgment. The pilgrims also cast stones at a stone pillar which represents Satan. The pilgrimage ends with a festival, called Eid Al-Adha, which is celebrated with prayers, the sacrifice of an animal, and the exchange of greetings and gifts in Muslim communities everywhere. In Arabic, the word ‘Umrah is derived from I‘timaar which means a visit. 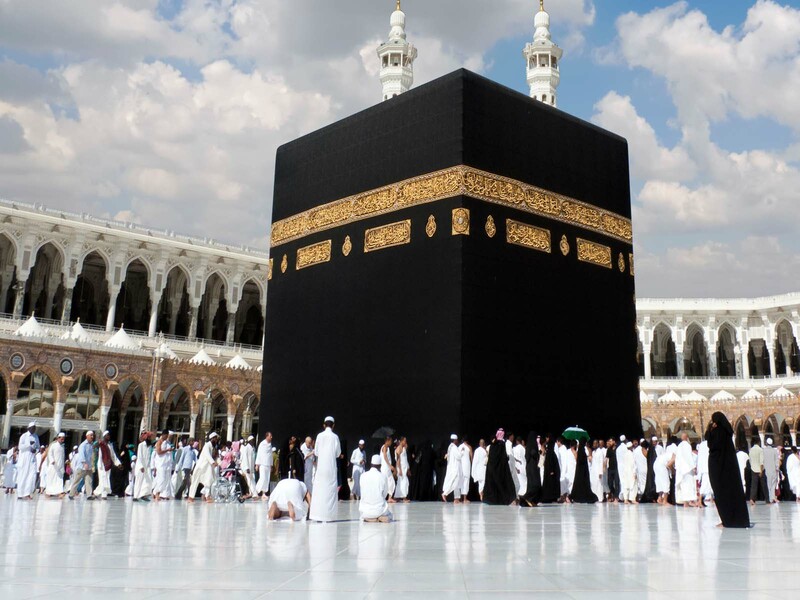 However, ‘Umrah in Islamic terminology, means paying a visit to Ka’bah, performing Tawaaf (circumambulation) around it, walking between Safaa and Marwah seven times. A performer of ‘Umrah puts off his Ihraam by having his hair shaved or cut. ‘Umrah can be performed along with Hajj and in other days as well. ‘Umrah can be performed during anytime in the year, there is no fixed time for ‘Umrah. Umrah is Sunnat Mu'akidah: Umrah is neither imperative (Fard) nor obligatory (wajib), but performing Umrah once in a life time is Sunnat Mu'akidah. However, once or more than once, whenever it is performed, it fetches great rewards. No Fixed Time: There is no fixed month, day or time for Umrah as it is for Hajj. As said earlier, it can be performed any time one desires. The Miqat for Umarh: The station of Ihram (Miqat) for Umrah is Hill for the residents of the Haram of Mecca and the people of Hill. As mentioned later, the area between the five appointed Miqats of Hajj and the bounds of the Haram of Mecca is called Hill. The Afaqis (outsiders) who come to Mecca for Hajj and Umrah should already be in Ihram before entering into Mecca. However, for subsequent Umrahs, even they have to go to Hill to put on Ihram. For this purpose, buses outside Bab Abdul Aziz of al-Haram take pilgrims to Masjid Aai'sha which is in Hill on Madinah Road at Tan'eem, not far from Mecca. The Rites of Umrah: The only rites of Umrah are: Entering the state of Ihram Tawaf of Ka'bah Sa'yee between the hills of Safa and Marwah Shaving or clipping of the hair In Umrah, pilgrims do not go to Mina, Arafat and Muzdalifa or throw pebbles on the Jamrahs (stone pillars representing devils) or offer animal sacrifice. These rites are performed during Hajj. Mausim Holidays being a pioneer in HAJJ & UMRAH packages in india , Enables the pilgrims to travel to islamic holiest shrines in comfort by taking care of all travel arrangements accomodation , foreign exchange , under the guidance of our reputed ulmas'sperform all the formalities of hajj. Delicious kerala food and a host of the other services.